In a tight labor market, building a pipeline of skilled workers can be a challenge. This work becomes even more difficult when you consider the changing needs of the workforce, whether it is new technology or transferring knowledge from baby boomers to millennials. Companies are increasingly finding that this is a challenge they cannot take on alone. Community involvement is a critical piece of the puzzle to creating a talent pipeline equipped to meet the dynamic demands of business. Community colleges, workforce development agencies, and community-based organizations are connected to untapped pools of talent and are equipped to help deliver the training needed to help build the skills needed quickly. To engage the community, companies should conduct a landscape analysis to identify partners and initiatives which can help them find the talent they need. When looking for community partners, it is easy to feel overwhelmed. But by focusing on a few key stakeholders to start, companies can narrow the field and find committed partners who can help co-create talent development strategies that provide benefits for the entire community. Start with your local Community College: Community colleges often have performance metrics related to student placement in jobs and even the number of companies they partner with, making them natural partners for talent pipeline development. Most community colleges have a workforce development programs that can be customized to fit the needs of a number of industries. Look at what career-technical education programs are offered in your area: Career-technical education programs are often aligned to the hiring needs of the community. Working with local school districts to learn about what programs they offer and building internships or work-experiences to help prepare students can provide a long term talent solution for companies. Chambers of Commerce have a wealth of knowledge: Chambers of Commerce have connections to both industry and education. Through working with the Chamber, companies can connect to a number of training providers and initiatives. Additionally, Chambers can connect companies facing similar hiring challenges to help centralize the needs of industry with training providers. Workforce Development Boards are often hubs for training activity: Workforce Development Boards are often charged with setting policy and fund workforce training initiatives and programs. There are often committees which companies can join to help influence how these policy and funding levels are determined. These committees are also great places to connect with companies facing similar challenges and with organizations committed to serving the needs of the community. Making your voice heard when curricula are being designed or updated: Companies are often asked to weigh in on training curriculum. This allows companies to work with community colleges and training providers to align the courses offered as part of a program to their hiring needs. Moving you to the front of the line to hire program participants: Companies that are part of regional initiatives often have the first chance to hire graduates, ensuring they can find candidates that have both the technical and professional skills needed to be successful employees. Saving costs when grants come around for training or hiring initiatives: Grant funded programs may include incentives for companies including subsidized wages or offset training costs. Want to learn more about how to engage with your community to help build a talent pipeline that works for you? Contact one of our workforce experts today. 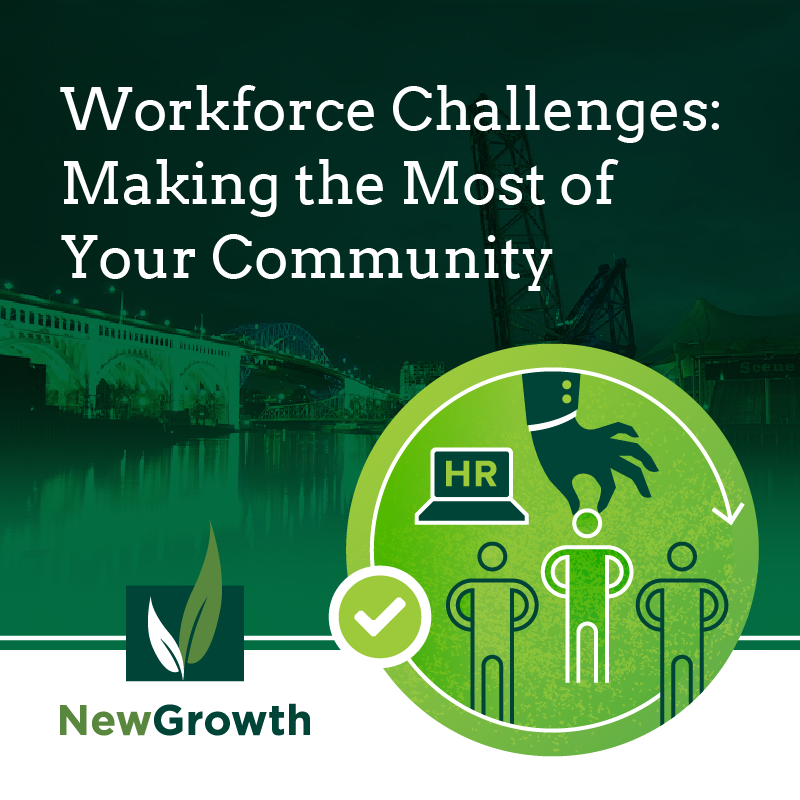 New Growth will talk through your hiring needs and talent pain points, analyze your local landscape, and report back to you on the players, programs and projects in your region. We can also make recommendations on where to place your bets and who you should call first.